I have very few polka dot pieces in my closet, so I was pretty excited when I bought this blouse in February. I then proceeded to wear it a mere three times, only one of which got photographed. However, when I saw Alissa, a self proclaimed lover of polka dots, wearing double dots last week I was both reminded and inspired to wear my blouse again. Have you entered to win pair of Converse shoes from Zelenshoes? 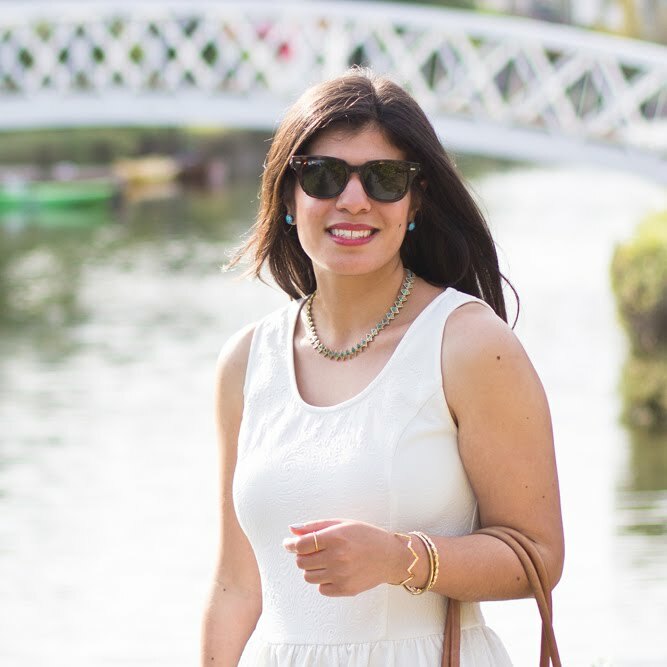 Linking up with Mix and Match Fashion's What I wore to "Work"
I love this. :) I ruined my polka dot shirt recently and now am on the hunt for another. Boo. I'm having some serious hair envy right now. Love this look! 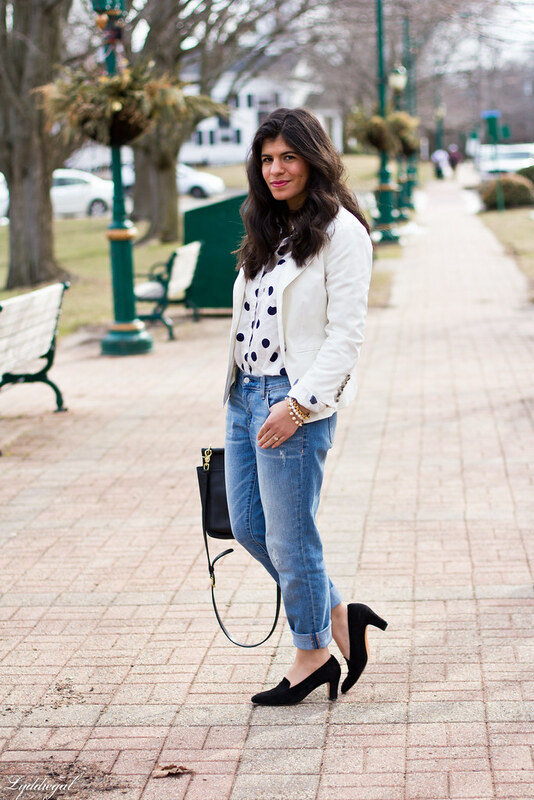 I have a polka-dot blouse that you're definitely inspiring me to wear. 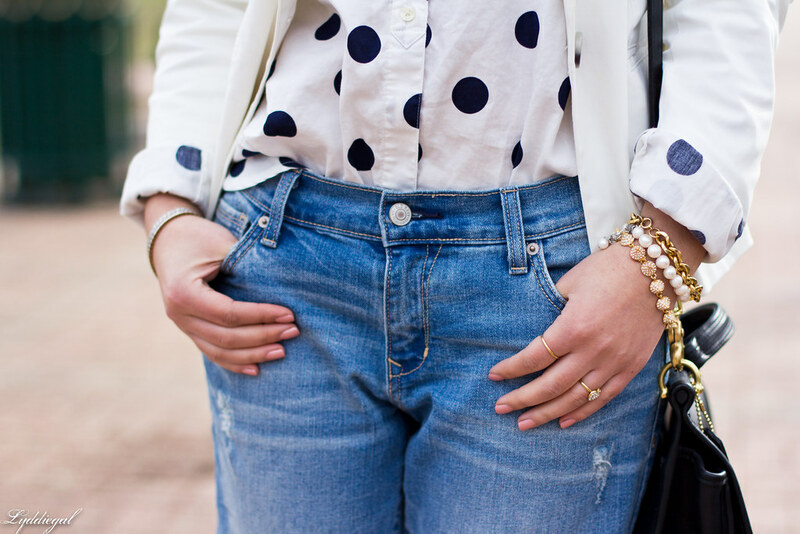 You can't beat polka dots for a fun, casual look. You should wear this blouse more often! Polka dots are always super cute! Great casual chic look Lydia! I recently purchased a polka dot top but have yet to wear it. I completely know how this happens - but I also have to say that this blouse definitely deserves to be worn more, it's such a beautiful basic and yet with a wonderfully fun twist. I mean, polkadots? I know I don't wear them enough. In fact, you have me thinking I should get my polkadot dress out! I love polka dots! Not as much as stripes, but they are up there. 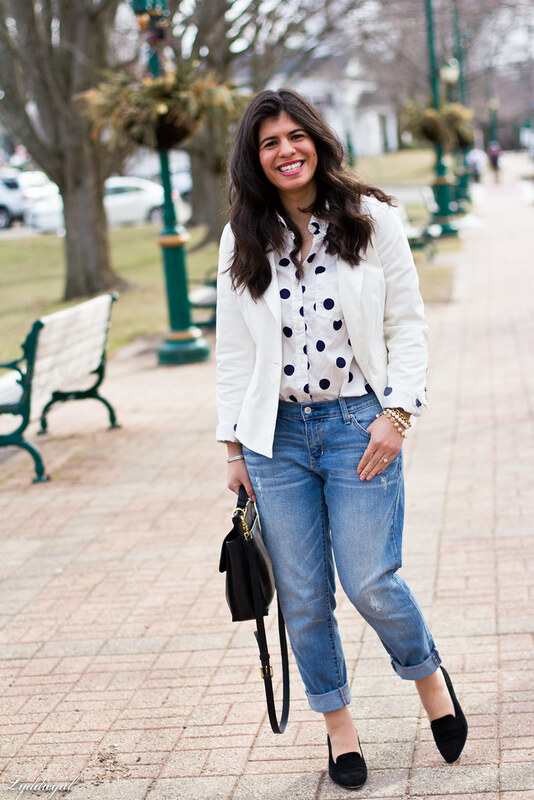 This is a cute blouse and I love it with the jeans and blazer! Those shoes are beautiful, and I love the white blazer over the white blouse! Lydia, you look so cute! 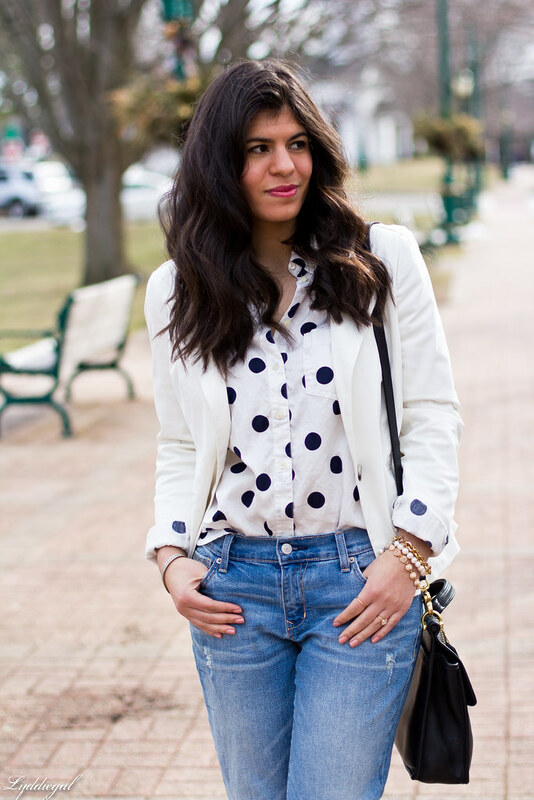 I love this polka dot top with the jeans, such a sweet casual look! These polka dots are so cute! My favourite piece today are your shoes - they are fantastic!! I love polka dots! Such a great top! 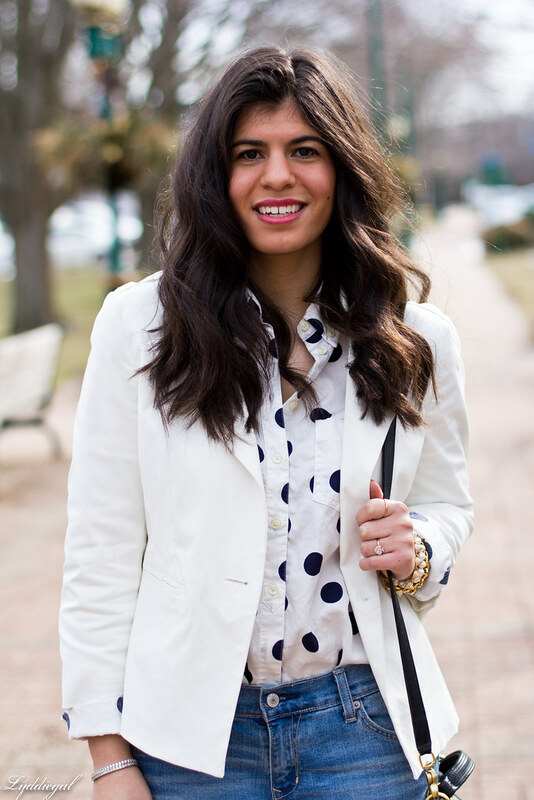 I have a polka dot button up too and just love it! It's great on it's own, with a blazer, or under a sweater! Love it with your white blazer! It looks so good Lydia! I need a white blazer in my life. HAHAHA It pairs well with it. Love your loafer heels. Love this look! 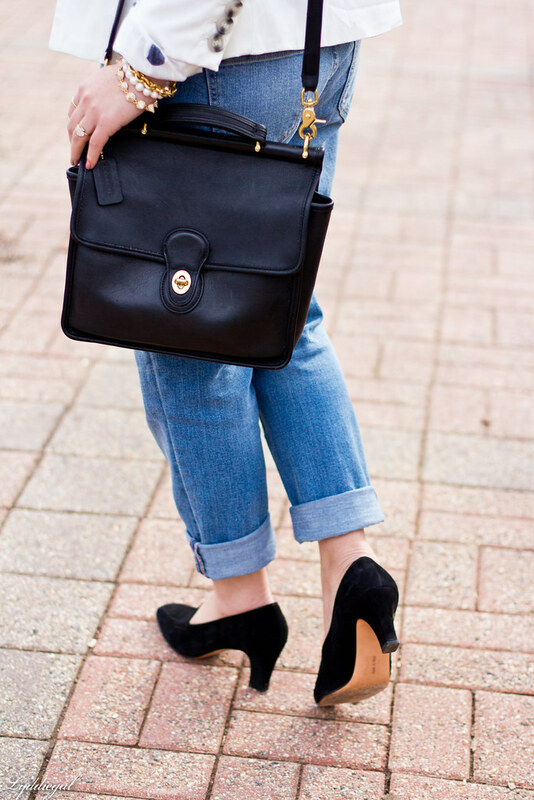 Those boyfriend jeans were made for you. I'm on the lookout for a good pair so I'll have to check out Old Navy! I love polka dots but I don't have a lot in my closet. I always even up buying stripes... I would love to have a polka dot blouse! Such a cute look! Such a cute combination! I love it paired with boyfriend jeans and a blazer! So cute! I'm such a fan of that larger size of polka dot. I love that the dots are slightly larger, such a great blouse! I just read on another blog that they're back.. and i did not know they'd ever left. 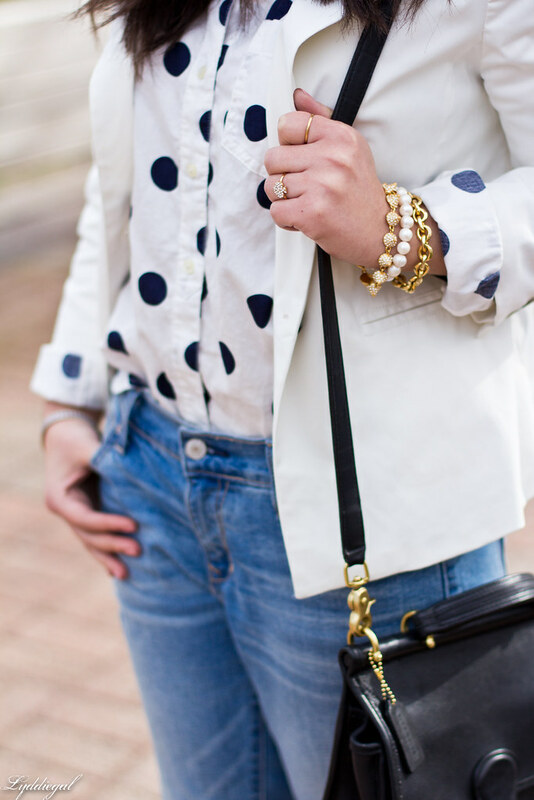 I love that it has big polka dots verses tiny ones and that you styled it with a white blazer. Super Chic! I so love polka dots. I have been trying to find more polka dot pieces lately. I just purchased a tulle skirt with polka dots. I love your blouse. love the large dots and the black and white. 1. Your hair looks amazing! 2. That blouse is darling! Adore. Absolutely freaking adore. Also, if that shirt just so happens to you know, not be super interesting to you in a while, tell me and I'm buying it from you! Fantastic spots and I am loving your hair! Pretty combo, love this shirt. You look simply lovely here Lydia! You are gorgeous in white! Double dots! What an exciting way to put it, hahaha! I love all the polka dots going on. Your pretty gold bracelets are so fun, too. Oh so adorable!! Love it. Would be fabulous with bright red shoes too :) You look great!